Today I will introduce cowplot, an extension of ggplot2 library. 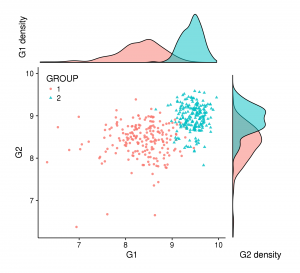 Some helpful extensions and modifications to the ‘ggplot2’ package. 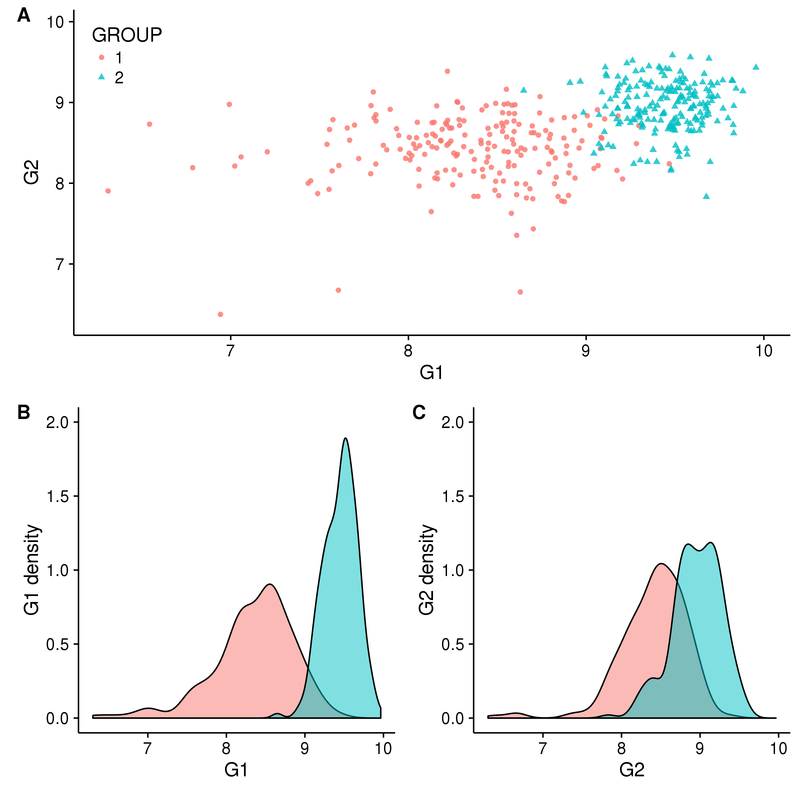 In particular, this package makes it easy to combine multiple ‘ggplot2’ plots into one and label them with letters, e.g. A, B, C, etc., as is often required for scientific publications. 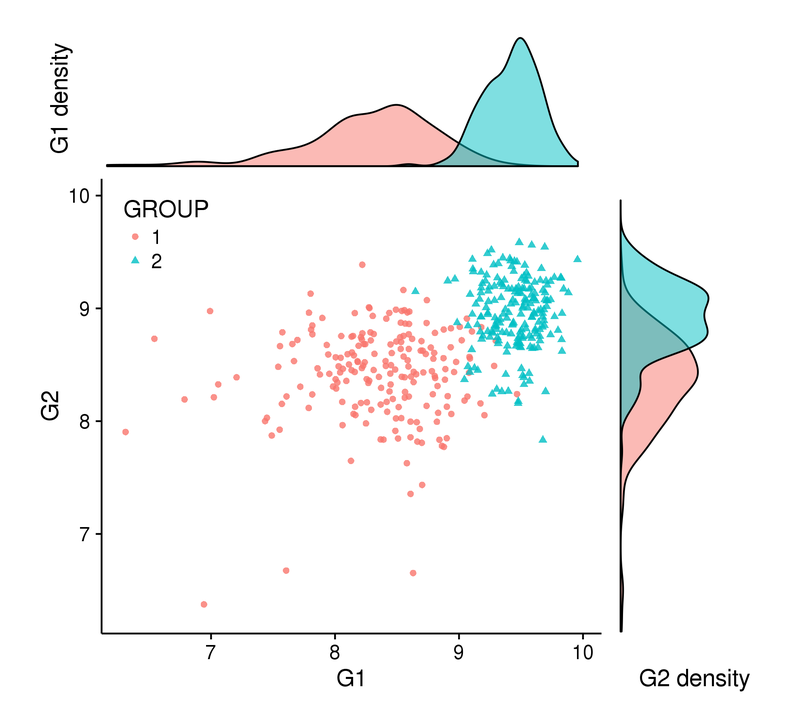 In this example, we first load two libraries: ggplot2 and cowplot. Then we need to generate expression level for two genes in two groups. To be interesting, the first gene will have an expression significantly different between the two groups (it’s not the case for the second gene). We start by displaying each information in distinct plots. The trick here is to save each plot into variables to allow us to manipulate them in next steps. 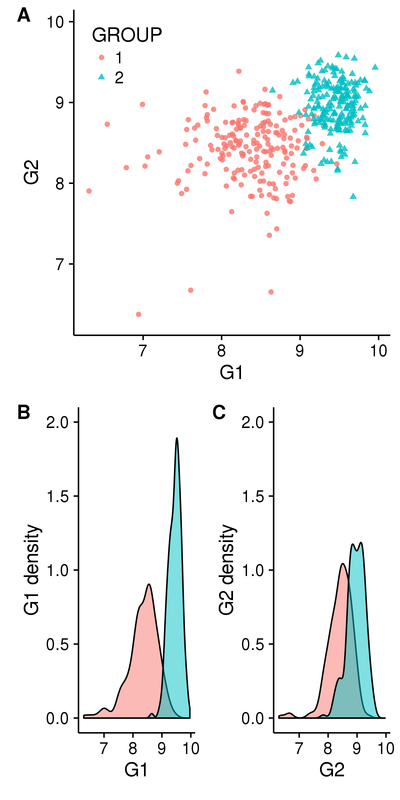 For this example, we choose to display a scatterplot of genes expression and the distribution for each group and each gene. 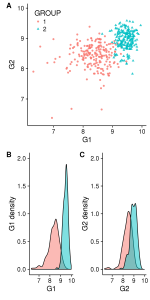 plot_grid(gg_scatter, gg_dist_g1, gg_dist_g2, nrow=1, labels=c('A', 'B', 'C')) #Or labels="AUTO"
Figure 1. A)Two groups comparison function to G1 and G2 expression. B)Distribution of G1. C)Distribution of G2. When we collapse several plots, we need to check that information is not duplicated (like legends). Also, to simplify the interpretation, it’s generally better if shared axes have the same scale in all plots. In our case, we can fix these points with the code below. To export or save your figure in a file and be sure to scale the overall figure size such that the individual figures look the way they do, cowplot propose to use the function save_plot, with the parameter base_height/base_width and ncol/nrow. This is just an introduction to the library cowplot. I’ve just mentioned 2 functions! In this library you can find more, like draw_plot to places a plot somewhere onto the drawing canvas. I use this function to overlay several plots, it can be useful when you want change the colour of the background based on a parameter. So if you want to go further, I recommend checking the vignettes or/and the manual here and let your imagination speak.